Summer on the Mornington Peninsula – there’s nothing quite like it. Long, balmy nights follow sunshine-filled days, perfect for exploring the multitude of attractions and experiences the Peninsula has to offer. Summer is the season for family outings, sightseeing, and discovery, especially with a six-week block of school holidays to fill. But not every family has the time off work, budget, or energy to keep active young minds occupied and outdoors every day of the holidays. On the days when you just want to call ‘time out’ and enjoy a lazy day at home, there’s a great way to keep the kids entertained and engaged, while encouraging reflection, planning skills, imagination and creativity. Creative writing – bringing your outdoor Peninsula experiences to life. We’re spoiled for choice when it comes to activities on the Peninsula. From our twinkling bays, to our dramatic coastline, lush green pastures, rolling green hills, and numerous sites of historical merit, there are many ways for kids to capture what they’ve seen and engaged with, and translate their experiences into fun writing projects. Add to the fun of your day at the beach by getting kids to collect their own stones to bring home and design. You can use felt tip pens, paint, or stickers to decorate your finds. Keep your story stones together in a bag or container. A simple way to use the stones is to have budding writers draw a stone from the bag and use it to start their story, then another stone is added and joins the story … and so on. There are numerous ways the stones can be used for verbal and written storytelling, and kids get to flex their artistic muscles in the decoration process too. The history and heritage of the Mornington Peninsula makes for many fascinating family outings. With an abundance of sites to explore, story-rich with colourful real-life characters, kids’ imaginations will be ignited by tales of our early years. Budding authors may wish to write a story set in a particular period and do their own research into how people lived. They might like to write about an object – real or imagined – found during a fictional archaeological dig. Perhaps their character goes back in time to meet someone from that era, or someone from the past ends up in our present. For inspiration, check out: The Briars, Coolart Homestead and Wetlands, Point Nepean and the Old Quarantine Station, Cape Schanck Lighthouse, McCrae Homestead, Beleura House and Sorrento. Journaling is massive with kids. It offers a great way to combine creativity with individualism, while chronicling daily thoughts and memories, and documenting events and outings. With simple tools of a notebook and pen, a journal makes a great record-keeper of summer outings and holiday experiences, as well as a place to record snippets of inspiration, write down achievements and aspirations, or list New Year resolutions and favourite things. journals make great Christmas presents and stocking fillers. Old school style, that is! For many contemporary kids the simple act of putting pen to paper to write a letter to a friend or relative is completely foreign, as is the thrill of receiving a hand-addressed envelope in their letter box. While digital communication is inarguably convenient – I’m looking at you, Facetime, email, and Skype – penning a personalised letter and posting it snail mail delivers multi-faceted benefits. Kids will hone their planning and composition skills as they work on the structure of their letter. Encourage them to be as descriptive as possible when talking about their holiday adventures. What did they see? What did they hear? Taste? Touch? Smell? Make sure they ask questions of their recipient to tap into the reciprocity of letter writing, and to elicit a response. Letter writing also helps kids glean an understanding of our postal system. Show them how to correctly address their envelope and look up post codes; give them money to purchase a stamp over the counter at the Post Office, and let them pop their letter in the mailbox themselves. Receiving a letter puts a smile on anyone’s face. Grandparents, especially, will appreciate the gesture and family news. Perhaps this could be the start of an ongoing letter exchange? With summer in the air, there’s no better time to head outdoors and immerse yourself in the natural beauty of the Mornington Peninsula. Everywhere you visit is an opportunity to fill creative buckets with writing inspiration. 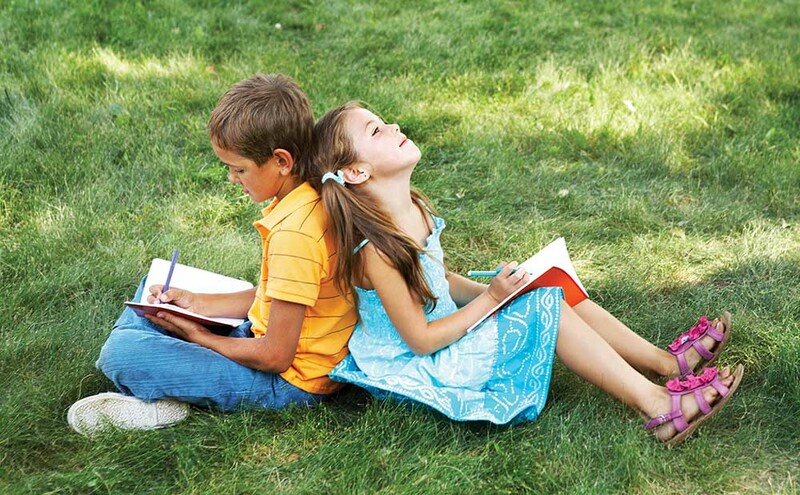 So, get the kids and get outdoors … and when it’s time for a change of pace, get writing! Rebecca Fraser operates StoryCraft Creative Writing Workshops for aspiring authors of every age and ability.